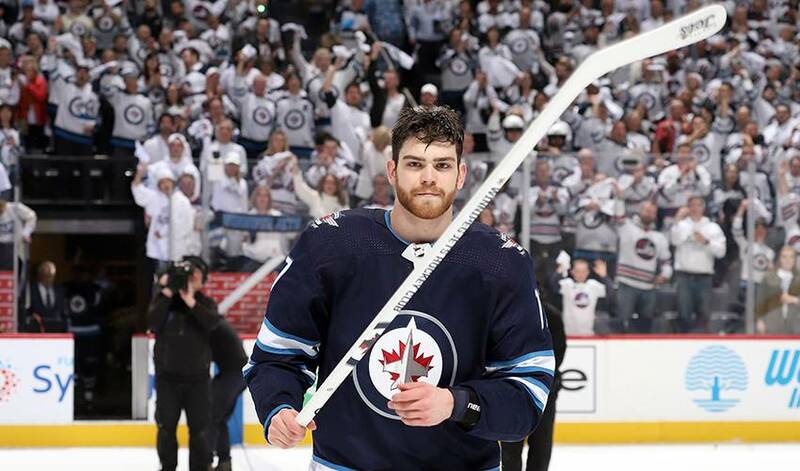 Winnipeg Jets forward Adam Lowry would like nothing more than a long and successful playoff run, just like his Dad enjoyed on a couple occasions during his 19-year pro career. David Lowry went to the Stanley Cup Final with the Florida Panthers in 1996 and again with the Calgary Flames eight years later. Adam was only three years old when the Panthers were swept by the Colorado Avalanche in the 1996 championship series, but he has vivid memories from the Flames' Stanley Cup bid that ended in Game 7 against the Tampa Bay Lightning. “I was in grade five and I was a little young, but I remember it being a lot of fun,” said the younger Lowry, whose Jets defeated the Minnesota Wild in five games in the opening round and will play the Presidents’ Trophy-winning Nashville Predators in their next series. The 25-year-old Lowry was born in St. Louis when his Dad was playing for the Blues and also lived in Florida and San Jose, where his father performed for the Sharks before he joined Calgary. “I have a lot of memories from that time, how the city was really behind the Flames,” said Adam. The 2003-04 season was his Dad’s final pro year. He saw action in 10 of Calgary’s 26 playoff outings that spring. “My Dad didn’t play in every game, but he was behind the bench in almost a player-coach type of role. After a few home games, the Lowrys drove down the Red Mile to further experience the good times. It was a similar atmosphere to what the hockey world saw in the first round with the Jets with the street party that grew for each game on Donald Street and the surrounding area outside the Bell MTS Centre. Dave Lowry always has played a big role in his sons’ careers. Joel, 16 months older than Adam, plays in the East Coast Hockey League with the Manchester Monarchs. The Monarchs also have advanced to the second round in the Kelly Cup playoffs after they swept the Reading Royals. Their father has just finished his first season as an assistant coach with the Los Angeles Kings. “He’s had a big impact, right from an early age,” Adam said. “I got to see how an NHL player prepared every day. My Dad was never really a guy who was guaranteed a roster spot and I’d see how hard he worked in the summertime, the hours he put in the gym and on the ice, and yet he would still find time to coach our baseball team and still being a real active Dad for us. The father/coach doesn’t try to impart too much teaching during the season unless Adam phones for advice. “He tries to catch as many of our games as possible,” Adam said. “He has a busy schedule, but it almost works out because he’s a couple hours behind. So he gets a chance to watch or at least have my game on as he prepares for his game and there are a lot of times we play on different nights. This also isn’t the younger Lowry’s first playoff run in pro. Four years ago, he helped the Jets' farm team, the St. John’s IceCaps, advance all the way to the AHL Calder Cup final against the Texas Stars. “It was a tough loss to lose in the final, but it also was quite the learning experience,” he said.